The Oregon Electric Railway (OER) was one of the largest electric railways in the U.S. Opening in 1908, the 122 mile electric railway line helped develop the Willamette Valley by enabling growth of many communities and served to transport people and Oregon-produced goods. Very little of the Oregon Electric equipment exists and none of it in Oregon. 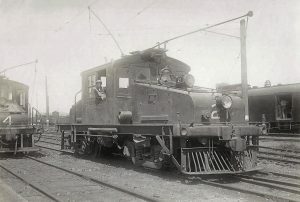 Of all the locomotives, OER #21 is one of only two that avoided being scrapped. 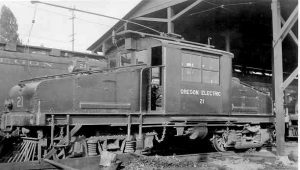 The #21 was one of four 60-ton locomotives built by GE – ALCO in 1912 for the Oregon Electric in order to meet the demands of the growing Willamette Valley. For the next 34 years it could be found moving freight from Portland south to Eugene and west to Forest Grove. In 1946, all four of these locomotives were sold to the British Columbia Electric Railway (BCER). Oregon Electric #21 became BCER #961 for another 34 year career of service until 1980. 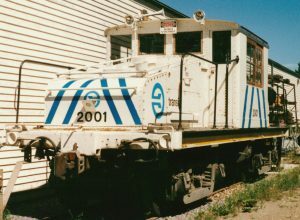 Saved once again from the scrapper, this unique locomotive was then purchased by the Edmonton, Alberta transit operation as their #2001. Here it began its third life and was used as a construction & maintenance locomotive throughout the transit system line until retirement in 1998. It was affectionately called “White Lightning” by the crews. It is now located at the Fraser Valley Railway Historical Society’s museum at Cloverdale, BC. The Fraser Valley group recently acquired two new interurban cars and now have more equipment than their site can accommodate. They have decided they need to sell Oregon Electric #21 and want to move it as soon as they can. Despite 86 years of service and 18 on display, the locomotive is essentially complete and certainly within the realm of restorability for OERHS. The locomotive was purchased and moved to the museum after a successful fundraising project on March 1, 2017.